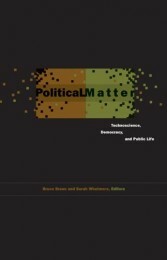 The ambitious task of this volume, edited by geographers Bruce Braun and Sarah Whatmore, is to bring science and technology studies and political theory into more direct dialogue with each other in order to compose a “more fully materialist theory of politics” (x). The contributors attempt to reposition the sciences and technologies that affect our everyday lives as more-than-human things that force thought and catalyze political events: as the very matters that gather and mobilize political life. The Virgin Mary, GMOs, oak pollen, dead rats, X-ray crystallography, plastic bags, household thermostats, the “abortion pill” and disaster preparedness systems (among others) have all been gathered together alongside their academic spokespersons. Emerging from a workshop at the University of Oxford in 2006, the volume asks us to take up this (re-)materialization of politics as an imperative task. Alongside previous writings in political ecology and science and technology studies (Latour 2004; Law 2004), the authors in the volume assert that technoscientific things are always-already productive entities, vital contributors and actants in collective life, and not solely external objects for political manipulation and control. Matter is produced and productive, generated and generative. Matter is agentive, not a fixed essence or property of things. Mattering is differentiating, and which differences come to matter, matter in the iterative production of different differences. Changing patterns of difference are neither pure cause nor pure effect; indeed, they are that which effects, or rather enacts, a causal structure, differentiating cause and effect. Difference patterns do not merely change in time and space; spacetime is an enactment of differentness, a way of making/marking here and now (Barad 137). In this spirit, the authors in the volume attempt to break outside of typical response patterns to human-nonhuman co-mingling that permeate both academic literature and public debates. Neither “fearful repudiation” nor “glib celebration” of the scientific and technological things that saturate our lives and co-determine our agency will do (x). Echoing Susan Leigh Star, the key question in reassembling political praxis in the wake of scientific and technological interventions becomes “cui bono” (43, cited in Kirksey and Helmreich 546). As the authors in this volume insist, we need more than anthropocentric utilitarian thinking and consensus orchestrated by economic and knowledge elites. We need nothing less than a rapprochement between the contents of the old categorizations of nature and culture that will adequately acknowledge their co-constitution in political life. The collection is organized into three parts. In Part One, “Rematerializing Political Theory: Things Forcing Thought,” Isabelle Stengers, Jane Bennett and William E. Connolly provide philosophical lines of flight from the central questions of how “originary technicity, the affective capacity and eventfulness of things, and their temporializing political effects change our definition of the political”(xxix). The essays in the first part of the volume sketch the broader framework and questions for the more detailed case studies contained in the other two parts. It is regrettable that neither Braun nor Whatmore contributes a research chapter to the volume. The collective creation and negotiation of scientific data entailed in Whatmore’s flood preparation research in the UK in particular would have been a welcome addition to a collection that contains a rich conceptual vocabulary for thinking about and examining technoscience-infused political discourse, but few examples of grounded, experimental praxis. However, the first section does provide provocative lines of inquiry. Stengers in particular provides an outline of a methodology, and attendant concerns, for working with the collective life of non-humans and their spokespersons. She provocatively suggests that collective identification of and response to nonhuman agencies in everyday matters of concern demands nothing less than dismantling the category of human. This is no deep ecology deconstruction that would dismantle the bias of human exceptionalism, but rather, a consideration of what political forms are appropriate once we have accepted relational ontology as fundamental. Part Two, “Technological Politics: Affective Objects and Events,” begins with an essay by Andrew Barry on the political appearance of metals and metallurgy, which are at once a part of complex heterogeneous assemblages and in possession of hard factual properties beyond social constructivism. A chapter from Gay Hawkins explores sensory and political encounters with plastic bags in everyday life. The section closes with an essay by Nigel Thrift on the spatial transformation of political imagination in virtual space. Hawkins’s essay is particularly effective in bringing political, STS and affect theory together. Hawkins emphasizes how environmental education about plastic often engages in a moral politics that limits both its reach and potential effectiveness. The substitution of cloth for plastic, the ubiquitous apologies at the checkout for forgetting one’s bags, and the guilty yearning for a ready-to-hand plastic bag for a wet swimsuit are all symptomatic of the “command morality” (121) of consumer environmental politics and its limitations. The participatory ethos of such a politics leaves room only for individual acceptance or refusal of preordained actions, and leaves aside all of the ways in which everyday, collective, practical dependencies upon plastic have developed. It refuses all that plastic is really caught up with: as Canavan, Klarr and Vu suggest, the matter of plastic is not only a product of oil capitalism, but will long outlast it, as an abject symbol of the modern fantasy of immortality gone awry (23). In the third section of the volume, “Political Technologies: Public (Dis)Orderings,” four essays appear: Noortje Marres on public/private contradictions in environmental campaigns to combat global warming that target household consumption; Andrew Lakoff and Stephen J. Collier on the conditioned visibility of critical infrastructure in disaster preparedness modeling; Lisa Disch’s cogent and succinct discussion of the problem of political representation as illuminated by the works of Bruno Latour, Isabelle Stengers and Hanna Pitkin; and Rosalyn Diprose’s “The Political Technology of RU486: Time for the Body and Democracy.” For me, Diprose’s chapter was the highlight of the collection. It tracks how the pharmaceutical “abortion pill” acted as a catalyst for the reactivation of Australian democracy outside of party lines and in defiance of classic theoretical and practical categorizations of zoe and bios, public and private, biological and technical. Drawing upon the biopolitics of Foucault and Agamben alongside the “deconstructive phenomenological formulations” (212) of Arendt, Nancy and Derrida, Diprose urges us to consider the tenuous boundaries between biological and ideological reproduction that are contained in the governance of reproductive technologies. Diprose’s feminist critique of reproductive futurism avoids the excesses of nihilism present in some contemporaries by exploring the possibilities presented by reproductive technologies for assisting in the contestation of dominant political ideology and its reproduction. She demonstrates how technological interventions in the process of conception, gestation and birthing have served to highlight the crucial role of women’s bodies in sustaining and/or disrupting the commonly recognized political collective. However, this crucial agency of natality “rests on the condition that that path is not forced or predetermined by appeals to a future continuous with the past, either in terms of biology or conservative ideology” (222). Whether this technologically introduced voice is encountered as threat to, or possibility for, a future non-continuous with the past depends upon the body (political and personal) that you inhabit. For anthropologists, one of the central assertions of the book would perhaps strike as a bit self-evident: namely, that technological practice and innovation cannot be categorized as external to what it means to be human. As Braun and Whatmore attest, “[t]here is no moment at which humanity comes to be contaminated by technical objects and practices—no fall from a world of things—because there can be no human without them” (xix). While tool use is not the exclusive domain of humans, it has been argued that the invention and elaboration of tools was a—perhaps the—crucial evolutionary driver for the development of the human brain (and, by extension, hubris). Stated otherwise, but with a slightly different emphasis, there will be no strictly technical fix to the problems presented to democracy by technoscience. Democratic life has perhaps always-already been playing catch-up. This volume argues for a re-attachment to technē as a crucial site for the examination of human ontology and potential, but only after the ideas of human exceptionalism and separateness have been abandoned (cf. Boelstorff; Ingold); human social interactions are to be seen as fundamentally ecologically embedded and responsive no matter how seemingly artificial the setting and contents. Alongside parallel work in the anthropology of science on multispecies relations and environmental ethics (see the excellent survey in Kirksey and Helmreich), the theoretical thrust of what Braun and Whatmore and their contributors are after is easy to agree with: that keeping the question of technē open is a matter of great importance, lest we continue diminishing ourselves and the ecological relations in which we are embedded. Otherwise, we risk mistaking politics for the process of “creating procedures that make possible a chain of command to be faithfully executed” (Stengers 19). The translation of this imperative into political praxis, creating a culture more tolerant of hesitation and capable of genuine implementation of the precautionary principle, is a much more difficult and variable task. Barad, Karen. Meeting the Universe Halfway: Quantum Physics and the Entanglement of Matter and Meaning. Durham: Duke University Press, 2007. Print. Boellstorff, Tom. Coming of Age in Second Life: An Anthropologist Explores the Virtually Human. Princeton: Princeton University Press, 2010. Print. Canavan, Gerry, Lisa Klarr, and Ryan Vu. “Ecology and Ideology: An Introduction.” Polygraph: An International Journal of Culture and Politics 22 (2010): 1-31. Print. Ingold, Tim. The Perception of the Environment: Essays on Livelihood, Dwelling and Skill. London: Routledge, 2000. Print. Kirksey, S. Eben and Stefan Helmreich. “The Emergence of Multispecies Ethnography.” Cultural Anthropology 25.4 (2010): 545-576. Print. Latour, Bruno. The Politics of Nature: How to Bring the Sciences into Democracy. Cambridge: Harvard University Press, 2004. Print. Law, John. After Method: Mess in Social Science Research. London: Routledge, 2004. Print. Jaime Yard is a doctoral candidate in the Department of Anthropology at York University in Toronto. Her research is an ethnographic and historical examination of the shifting material and discursive construction of livelihoods and landscapes in a coastal community in British Columbia. Logging machinery, herring fisheries, aggregate and housing renovations are some of the ‘things’ that guided her fieldwork in a community undergoing an economic base change from logging and fishing to recreational and retirement real estate development.